Sony India unveiled its stunning super mid-range model in its refreshed “X” series, Xperia XA1 Ultra. Building on the success of last year’s XA Ultra, XA1 Ultra features a beautiful borderless design to make the most of the edge-to-edge screen, two great cameras that are worthy of a high-end premium status and an octa-core processor. Camera expertise is taken from Sony’s digital camera division to deliver a leading rear camera for XA1 Ultra offers 23MP high resolution with a large 1/2.3” Exmor™RS for mobile sensor, bright F2.0 lens and superior lowlight capability. You’re guaranteed a superfast journey from launch to capture in 0.6s and incredibly fast and accurate Hybrid Autofocus, so even the most spontaneous moments are always in focus. Front cameras are the backbone of the selfie world, XA1 Ultra features a 16MP front camera with Optical Image Stabilizer to eliminate the effects of handshake and improve low-light selfies. XA1 Ultra comes with a Smart selfie flash to naturally illuminate your face, now enjoy amazing selfies even in low-light conditions. It allows you to capture the perfect selfie easily with just a wave via the ‘Hand Shutter’ camera feature. 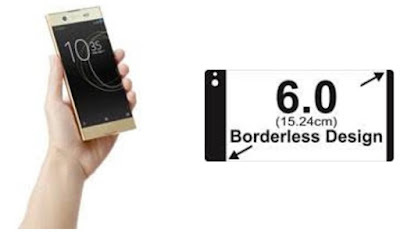 The beautiful borderless design has been further refreshed to create the illusion of a seamlessly never-ending surface whose curvature aids the perfect fit in your hand. The edge-to-edge Full HD (1080p) 15.24 cm screen on XA1 Ultra is supported by display technologies to deliver a crisp, sharp viewing experience. Sony craftsmanship is clear to see with the diamond cut-like finish on top and bottom, along with the choice of materials such as the aluminium sides which create a rich feel in the hand. With the power-efficient MediaTek Helio P20 octa-core processor you get a quick and smooth experience, whether you browse the web, watch a video or play your favourite game. The 4 GB RAM takes your gaming and movie viewing experience to the next level. You can not only enjoy seamless gaming and movies but also store them endlessly with huge Internal memory of 64 GB, which is expandable upto 256 GB using a memory card. XA1 Ultra is designed to ensure a longer lasting performance over the smartphone’s lifetime. Qnovo Adaptive Charging monitors the battery’s health and adjusts charging current accordingly to avoid damage and maximise lifespan whilst Stamina Mode keeps your battery going for longer when you really need it the most by disabling some of the functions and extending the lifetime. Sony’s Smart Cleaner cleverly manages the performance and memory of your device by clearing the cache and unused apps automatically in order to attain the best speed and performance without degradation over time. Additionally both models support quick charging to give you hours of power in just a few minutes charging. Xperia Actions is a new addition to XA1 Ultra that aims to learn your usage patterns to simplify your daily life by suggesting customisable settings and personalised recommendations. For example, when you go to bed your Xperia can learn your bedtime routine and automatically adjust the screen brightness and call volume. Or if you have travel plans your Xperia will be able to assist you before and when you arrive by detecting your location at an airport and suggesting you allow it to download offline maps and a local language dictionary. Xperia XA1 Ultra comes with quick charger, UCH-12, bundled with the phones as supplied accessory. With QC-3.0 charging the phone can be charged 60% in 45 minutes. Xperia XA1 Ultra comes equipped with latest Type C USB connector for faster data transfer and charging speeds. The latest and most updated version of Android OS is available out of the box in Xperia XA1 Ultra. Now carry and protect your XA1 Ultra in style with Style Stand Cover –SCSG40 of Rs. 3,490. Style stand cover is already available in the market in Black and White colour. This cover has an in-built stand so you can enjoy long movies and videos without any hassle for long hours. Xperia XA1 Ultra is available in all Sony Center and major electronic stores across India.